Occurrence: Generally eaten as cooked crab but also cooked in mixed seafood dishes such as paella. Crabsticks contain both finfish meat and some crab for flavour. Crabs along with crayfish, lobsters and shrimps are crustaceans. Food allergy to crustaceans is relatively common, symptoms ranging from mild oral allergy to severe symptoms such as anaphylaxis. Cooking does not remove the allergen. Crustacea are the third most important cause of food induced anaphylaxis after peanuts and tree nuts (cashews, almonds, pecans, walnuts, etc.). Thus crustacea and products thereof are listed in annex IIIa of the EU directive on labelling of foods and must be labelled when used as ingredients in pre-packaged food. Crustaceans are among the most commonly consumed seafoods. Crustaceans belong to the Arthropod family. Crustaceans are divided into six major subgroups that include 44,000 species. Amongst these is a variety of commonly and less commonly eaten sea foods like langoustine, lobster, crayfish, and crab. Other sea foods like clams, mussels, oysters, scallops, abalone and squid are no crustaceans but molluscs or shell fish. Crustacean allergy is a so-called IgE-mediated food allergy. IgE (Immunoglobulin E) is the allergy antibody. Reactions range from mild oral allergy syndrome (itching of the lips, mouth, or throat, and swelling of the lips, tongue, throat, and palate) to life-threatening systemic anaphylaxis (difficulty breathing, drop in blood pressure, and even death). Symptoms occur within one to one hour of ingestion (90% of cases). However, urticaria (hives) is the most frequent symptom. Others symptoms affecting the skin (itching, swelling), gastro-intestinal tract (nausea, cramping heartburn, and diarrhoea), respiratory symptoms (asthma, hayfever), and eyes (conjunctivitis) have been reported. Shellfish are frequently implicated in fatal anaphylactic reactions and are the third most important cause of anaphylaxis after peanuts and tree nuts (cashews, almonds, pecans, walnuts, etc.). Symptoms most often occur when the seafood is ingested (generally require higher doses to elicit a reaction), but can also appear when raw seafood is handled and even after inhaling steam while crustaceans such as shrimp are being cooked (may cause respiratory reactions). Cooking oil contaminated with seafood residues has also been reported to cause adverse reactions. Allergic reactions in workers at every stage of seafood processing also occur and are a serious public health problem in countries with major shellfish industries. It has been estimated that 75% of individuals who are allergic to one type of crustacean (shrimp, lobster, crawfish, or crab) are also allergic to another type. This is referred to as cross-reactivity. Cross-reactions between crustaceans and molluscs (oysters, squid, scallops) are also possible involving the same type of proteins in these foods. In fact, the molecules responsible for the cross-reactions can also cause cross-reactions between crustaceans, dust mites, cockroaches, and chironomid (used as fish food). However, no cross-reactions have been reported between crustaceans and fish such as Pollock, salmon, tuna, mackerel, trout, and anchovies. Who, when, how long and how often? Food allergies are most frequent in children, but adults are not exempt. Crustaceans, peanuts, fish, and tree nuts are the most common causes of food allergies among adults. Fish and shellfish allergies are estimated to affect approximately 1% of the general population. Countries where large amounts of crustaceans are consumed, such as the Scandinavian countries, have higher rates of crustacean allergies, although no species-specific studies have been conducted. Little is known about their persistence, but all evidence indicates that crustacean allergies are usually not outgrown. While one shrimp is often enough to induce an allergic reaction, some people react to even smaller amounts. Lowest threshold dosages remain to be elucidated. A detailed patient history is first taken. Skin and laboratory tests are then used to help eliminate allergic foods from the diet. In the case of crustaceans, a positive skin test combined with elevated antibody levels allow shrimp allergies, for example, to be diagnosed with 87% certainty. There is no established threshold value for crustacean specific IgE. However, food challenges (giving increasing amounts of potentially allergic food in graduated steps to patients to determine whether they will have an allergic reaction) are the most effective way of determining whether a person is truly allergic to a certain food. Initial food challenges are always conducted as double-blind, placebo controlled tests. In the case of crustaceans, for example, food challenges involve double-blind, placebo-controlled tests using increasing doses of the boiled crustacean in vanilla ice cream containing grape flavouring. If the double-blind placebo-controlled food challenge is negative, an open food challenge is generally performed. Food challenges should only be performed in a hospital setting with highly trained personnel used to dealing with anaphylactic reactions. Patients with a recent history of severe reactions should not be challenged. In addition, patients that are allergic to one type of crustacean should be tested for allergies reactions to all the other crustaceans because of the potential for cross-reactions. Where do I find crustacean? Crustaceans or crustacean residues may be present in certain processed foods. It is thus very important that people with allergies to crustaceans develop the habit of carefully reading ingredient labels and be aware of the words, terms, and indicators used on labels that indicate the presence of crustaceans or crustacean residues. Food products can contain hidden allergens. Crustaceans are used in few non-food products such as creams. Contact with these products can induce allergic reactions. For patients diagnosed with a crustacean allergy, avoidance of crustaceans is the only proven therapy, especially since adverse reactions to very small amounts of crustaceans are not uncommon. It is thus very important that people with allergies to crustaceans develop the habit of carefully reading ingredient labels and that they are aware of words, terms, and indicators used on labels that indicate the presence of crustaceans or crustacean residues. Food products can contain hidden allergens. Eating out especially in restaurants with South-East Asian cuisine is a risk factor for unexpected contact with crustaceans. Annex IIIa of the new EU labelling directive makes the listing of crustaceans and crustacean products on labels mandatory. 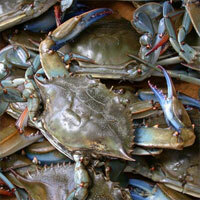 The photograph shows Callinectes sapidus, the blue crab. 1. Charybdis feriatus (NEWT 65693) has the rarely used English name of the Crucifix crab. 2. Cancer pagurus (NEWT 6755) is the rock crab. This is extracted to make the Pharmacia CAP crab extract F23. 3. Chionoecetes opilio (NEWT 41210) is the snow crab. It is also called the crab beetle, spider crab or queen crab. 4. Callinectes sapidus (NEWT 6763) is the blue crab. 5. Portunus trituberculatus (NEWT 210409) is the Japanese blue crab, swimming crab or gazami crab. 6. Scylla serrata (NEWT 6761) is the mud crab. Like the shrimps associated with food allergy, crabs are decapodes and are believed to have evolved from a Devonian shrimp-like ancestor. Crabs evolved from shrimps by shortening their tail and folding it under their body. This may have occurred several times during evolution (Ahyong & O'Meally, 2004 ; Dixon et al, 2003 ; Morrison et al, 2002 ). However, crabs are more closely related to each other than are the shrimps, http://tolweb.org/tree?group=Decapoda, as the division between penaeoid and true shrimps, Eucarida, occurred early in Decapod evolution. Morrison CL, Harvey AW, Lavery S, Tieu K, Huang Y, Cunningham CW. Mitochondrial gene rearrangements confirm the parallel evolution of the crab-like form. Dixon, CJ; Ahyong, ST; Schram, FR. A number of articles on crab allergy do not report the species of crab involved. As noted by Wu & Williams (2004) , it is difficult to identify the species used to prepare foods and some restaurants replace expensive species by cheaper substitutes. Wu & Williams (2004)  reported that 37 out of 84 shellfish allergic patients named crab as causing symptoms (second only to shrimp with 44/84). Over all 84 patients, symptoms included anaphylaxis requiring emergency medical treatment in 33.3% (28/84) of cases. 2 patients reported asthma, 1 contact urticaria only and the other 53 patients reported cutaneous symptoms. Castillo et al. (1994) list symptoms for allergy to "shellfish", which included crab, in 48 patients. 35 reacted following ingestion alone, 2 following inhalation and 9 following both routes of exposure while 2 patients showed contact urticaria only with crustacea. Symptoms were urticaria in 39 patients, asthma in 18, rhinitis in 14, gasterointestinal symptoms in 7, anphylaxis in 4 and exzema in 3. The number reacting to crab alone was not given but 18 reacted to shrimp, squid, lobster and crab. Imai et al. (1992)  report a case of exercise and alcohol dependent anaphylaxis to crab. Yunginger (1988)  reported a case of fatal anaphylaxis after eating crab. Atkins et al. (1985)  reported a clinical history of flushing, urticaria, largyngeal and oropharyngeal oedema in a patient who had a positive oral challenge to crab. Wu & Williams (2004)  and Daul et al. (1987)  used an extract from Callinectes sapidus. This was extracted at 4°C from boiled crab in PBS, centrifuged, concentrated and sterile filtered. Sheah-Min & Choon-Kook (2001)  used commercial allergens (Bencard). Helbling et al. (1996)  made an extract of blue crab, Callinectes sapidus, by blending 500g of meat after boiling for 15 minutes in 1L of 0.01M PBS, pH 7.2, in a Waring blender for 1-3 minutes at room temperature. The mixture was extracted overnight at 4°C and centrifuged (70,000 g). Supernatants were concentrated with an Amicon YM1 filter (molecular weight cut-off 1 kDa) and recentrifuged (180,000 g). The extracts were sterile filtered and checked for sterility. Samples were diluted to 10 mg./ml. with sterile glycerol. Protocol: (controls, definition of positive etc)Wu & Williams (2004)  defined a positive SPT as 3 mm greater than the negative control. Wu & Williams (2004)  tested 84 patients who had reported shell fish allergy. Sheah-Min & Choon-Kook (2001)  tested 143 patients with allergic rhinitis. Helbling et al. (1996)  tested 39 patients allergic to fin fish. No skin prick studies explicitly using Charybdis feriatus have been reported. However, skin pricks using other species have been reported. Wu & Williams (2004)  reported that 57% of patients gave a positive skin prick test with crab. Patients reacting to crab were likely to react to shrimp and lobster (70% and 73%). Sheah-Min & Choon-Kook (2001)  found that 46/143 patients gave a positive skin prick test to crab and claimed to be allergic to crab. 33/143 also gave a positive skin prick but stated that they were not crab allergic. All patients who reported allergy to crab gave a positive SPT. Helbling et al. (1996)  report that 13/39 fish allergic patients gave a positive SPT to crab (Callinectes sapidus) extract. Leung et al (1998)  prepared Charybdis feriatus claw muscle extract by homogenizing 0.5 g of the claw muscle in PBS, pH 7.2, with a polytron. Thereafter, the extract was mixed for 8 hours at 4°C and then centrifuged at 5000g for 15 minutes. The supernatant was collected and stored in small aliquots at –20°C until use. Chiou et al. (2003)  used commercial extracts from Cancer pagurus. Leung et al (1998)  used immunoblotting and immunoblot inhibition against crab extract and recombinant Cha f 1. Chiou et al. (2003)  used the CAP-FEIA system. Leung et al (1998)  used sera from 10 crab allergic patients and 5 controls. Chiou et al. (2003)  used sera from 67 patients. Summary of Results:Chiou et al. (2003)  found that IgE from 27/67 sera bound the extract from crab, Cancer pagurus (F23), 28/67 bound shrimp extract (F24) and 20 sera bound both allergens. There was a significant correlation of reactivity between crab, Cancer pagurus, and F24 from shrimp, Pandalus borealis. Immunoblotting separation:Leung et al (1998)  separated proteins by 8% SDS-PAGE. Immunoblotting detection method:Leung et al (1998)  transferred proteins onto a nitrocellulose filter. Sera from patients with crustacean allergy (at 1:10 v/v dilution in PBS containing 3% w/v milk powder) were incubated for 8 to 12 hours at 4°C with 100 µg of recombinant Cha f 1 in a final volume of 1 mL. Sera were also incubated with 100 mg of recombinant glutathione S-transferase as control. IgE reactivity determined with the use of 125I-labeled anti-human IgE (Sanofi-Pasterur Diagnostics). Immunoblotting results:Leung et al (1998)  found that IgE from 10/10 sera bound to a protein from crab extract running at 34 kDa and to recombinant Cha f 1 at 60 kDa. Binding to extract was inhibited by rCha f 1 and also by rMet e 1 and rPan s 1. Food used and oral provocation vehicle:Atkins et al. (1985)  and Atkins et al. (1985)  used crab purchased from a local supermarket (species not reported). Atkins et al. (1985)  and Atkins et al. (1985)  gave initial blind challenge with 10g of crab meat followed by open challenges with 100g doses. Number of Patients:Atkins et al. (1985)  and Atkins et al. (1985)  challenged 1 patient with crab. Atkins et al. (1985)  report a negative blind challenge with 10 g followed by an open challenge with 100 g doses and response at a cumulative dose of 210 g of crab. Atkins et al. (1985)  report a single positive challenge with crab causing sneezing, rhinitis, largyngeal oedema, flushing and urticaria at a cumulative dose of 210 g of crab (open challenge). There is strong IgE cross-reactivity between allergens from all crustacea. The most important allergen in these species is tropomyosin and DeWitt et al. (2004)  reported that recombinant Pen a 1 bound 94% of the IgE from the 6 crustacea specific sera. As tropomyosin is strongly conserved in sequence with more than 99% identity amongst penaeoid shrimps and 92% identity between more distantly related crustacea such as a penaeoid shrimp (Farfantepenaeus aztecus) and a crab (Charybdis feriatus), allergy to crustacea is generally treated as a single allergy. DeWitt et al. (2004)  also showed specific IgE binding to recombinant Pen a 1 and seven invertebrate extracts with 9 sera. 6 sera bound extracts from crustacea most strongly, 2 bound dust mite extract more strongly and one serum showed similar binding with both extracts. rPen a 1 bound 94% of the IgE from the 6 crustacea specific sera and gave 50% inhibition of the binding of extracts at about 0.1 µg/ml. However, the crab used by DeWitt et al. (2004) was Cancer pagurus. Leung et al (1998)  reported the percentage of amino acid identity of crab Cha f 1 with the known allergens Met e 1 from shrimp, Pan s 1 from spiny lobster and Hom a 1 from Homarus americanus as 90%, 91%, 92%. Also the tropomyosins from Homarus americanus slow muscle, from fruit fly and from chicken were 96%, 69% and 60% identical respectively. As might be expected at this level of similarity, these authors found that IgE from the sera from 10/10 crab allergic subjects bound the recombinant shrimp and lobster tropomyosins (rMet e 1, rPan s 1 and rHom a 1). Chiou et al. (2003)  studied IgE cross-reactivity of 67 sera from patients allergic to multiple allergens with 36 Pharmacia allergens. There was a significant correlation of reactivity between crab, Cancer pagurus, (F23) and shrimp, Pandalus borealis (F24). IgE from 27 sera bound crab (F23), IgE from 28 bound shrimp (F24) and IgE from 20 sera bound both allergens. Inhibition studies on IgE binding in 15 sera gave an inhibition of >50% between 3 shrimp and cockroach reactive sera, an inhibition of >50% between 11 shrimp and crab reactive sera, and an inhibition of >50% between 4 crab and cockroach reactive sera. Leung et al (1996)  report that 9/9 sera from shrimp allergic patients reacted to mud crab (Scylla serrata) and lobster (Panulirus homarus) extracts. Lehrer et al. (1985)  used crossed immunoelectrophoresis to show that of the 7 allergens detected from white shrimp, 5 cross-reacted with crayfish, 3 with lobster and 1 with crab extract. Two precipitins appear to be common crustacea allergens and were present in shrimp, crayfish, lobster and crab. Similarly, skin prick tests and RAST with extracts of shrimp, blue crab (Callinectes sapidus), crawfish (Procambarus clarkii), and lobster (Panulirus sapidus) were highly correlated (Daul et al., 1987 ). As expected, Helbling et al. (1996)  did not demonstrate any IgE cross-reactivity between finfish and crab (Callinectes sapidus), crawfish (Procambarus clarckii), lobster (Palinurus argus) or shrimp (Litopenaeus setiferus). Occupational allergy to crustacea including snow crab has been reported (Cartier et al. 1986 ; Desjardins et al. 1995 ; Ortega et al. 2001 ). Cartier et al. 1986  used both extracts of meat or snow crab (Chionoecetes opilio) cooking water to demonstrate sensitisation by SPT. Cartier et al. 2004  report that the prevalence of sensitisation in different crab plants varied from 50% (n=19) to 15% (n=16) and the prevalence of certain or highly probable crab asthma varied from 50% (n=19) to 9% (n=3). A preliminary report describes immunoblotting with these sera (Hefle et al. 1995 ) and reported multiple IgE- reactive proteins of 25 to 45 kDa and 5 IgE proteins of 14 kDa or less in snow crab meat and cooking water extracts. 5 of 18 sera showed IgE binding to single bands at 38 to 41 kDa. Wu et al. (2002)  suggests that exposure to crab as an aerosol can be associated with atopic dermatis. Such aerosols may be responsible for occupational allergies to crab. Lin et al. (1993)  found clear evidence for a 39 kDa allergen which is an arginine kinase from Japanese blue crab, Portunus trituberculatus. Ortega HG, Daroowalla F, Petsonk EL, Lewis D, Berardinelli S Jr, Jones W, Kreiss K, Weissman DN. Respiratory symptoms among crab processing workers in Alaska: epidemiological and environmental assessment. Imai K, Tokuno T, Sakamoto S, Kondo Y, Tsujisaki M, Sugiyama T, Hinoda Y, Yachi A. [A case of food-dependent anaphylaxis induced by alcohol] Japanese. Leung PS, Chen YC, Mykles DL, Chow WK, Li CP, Chu KH. Molecular identification of the lobster muscle protein tropomyosin as a seafood allergen. Leung PS, Chen YC, Gershwin ME, Wong SH, Kwan HS, Chu KH. Identification and molecular characterization of Charybdis feriatus tropomyosin, the major crab allergen. Evaluation of immediate adverse reactions to foods in adult patients. I. Correlation of demographic, laboratory, and prick skin test data with response to controlled oral food challenge. Leung PS, Chen YC, Chu KH. Seafood allergy: tropomyosins and beyond. Castillo R, Carrilo T, Blanco C, Quiralte J, Cuevas M.
Shellfish hypersensitivity: clinical and immunological characteristics. Helbling A, McCants ML, Musmand JJ, Schwartz HJ, Lehrer SB. Immunopathogenesis of fish allergy: identification of fish-allergic adults by skin test and radioallergosorbent test. Hefle SL, Bush RK, Lehrer SB, Malo J-L, Cartier A. Snow crab allergy: identification of IgE- binding proteins. Wu CS, Yu CL, Chang CH, Kuo WR, Lin HJ, Yu HS. Effect and correlation of serum total IgE, eosinophil granule cationic proteins and sensitized allergens in atopic dermatitis patients with or without rhinitis. Allergen epitopes:Not known for Cha f 1. However, the data on shrimp allergens Pen a 1 and Pen i 1 might be relevant. Process, chemical, enzymatic:The allergenicity of crustacea can survive cooking, possibly because tropomyosin have a very simple helical structure which can rapidly refold after denaturation. Extracts from boiled crustacea are frequently used in allergen purification and for extract preparation. Leung et al (1998)  reported the percentage of amino acid identity of crab Cha f 1 with Met e 1, lobster Pan s 1 and Hom a 1 and Homarus americanus slow muscle, fruit fly and chicken tropomyosins as 90%, 91%, 92%, 96%, 69% and 60% respectively. They found that IgE from the sera from 10/10 crab allergic subjects bound rMet e 1, rPan s 1 and rHom a 1. DeWitt et al. (2004)  report that the level of sequence identity of tropomyosins with Pen a 1 is 99% for lobster (Homarus americanus), 92% for crab (Charybdis feriatus), 78-82% for insects and dust mites, 71% for a nematode (Caenorhabditis elegans) and 57% for both blue mussel (Mytilus edulis) and human, suggesting that IgE cross-reactivity is very likely for the invertebrate tropomysosins. DeWitt et al. (2004)  also showed specific IgE binding to recombinant Pen a 1 and seven invertebrate extracts with 9 sera. 6 sera bound extracts from crustacea most strongly, 2 bound dust mite extract more strongly and one serum showed similar binding with both extracts. rPen a 1 bound 94% of the IgE from the 6 crustacea specific sera and gave 50% inhibition of the binding of extracts at about 0.1 µg/ml. However, the crab used by DeWitt et al. (2004) was Cancer pagurus. Allergen properties & biological function:Tropomyosins bind to actin in muscle increasing thin filament stability and rigidity. Depolymerization from the pointed end is inhibited, without affecting elongation (Broschat, 1990 ). As tropomyosin prevents the binding of myosin, it may play an important role with troponin in controlling muscle contraction. The sequence exhibits a prominent seven-residues periodicity and this is reflected in the interactions of the 2 polypeptide chains which form a coiled coil structure of two alpha-helices as originally proposed by Crick in 1952 (see the porcine structure 1C1G). Some tropomyosins are N-acetylated modifying the structure of the N terminal region and increasing the affinity for the thin filaments (Greenfield & Fowler, 2002 ). Allergen purification:Leung et al (1998)  identified cDNA encoding Cha f 1 by screening against allergic sera and cloned it into the EcoRI site of plasmid expression vectors pGEX (as fusions with glutathione S-transferase). Recombinant Cha f 1 was purified from cells harvested from a 500-mL overnight culture which had been induced with 1 mM IPTG. The cells were suspended in 5 mL of lysis buffer (1% Triton X-100, 1% Tween 20, 10 mM dithiothreitol) and sonicated. The cell lysate was then spun to pellet the debris, and the supernatant was added to glutathione agarose. After incubating for 2 hours on a rocker, the glutathione agarose was washed 3 times with PBST (PBS containing 1% Triton X-100, pH 7.3) and the bound protein eluted with 2 mL of 5 mM reduced glutathione in 50 mM Tris-HCl, pH 8.0. The purified protein was quantified and the purity determined by SDS-PAGE and immunoblotting, revealing a pure protein band of 60-kDa as expected for a fusion protein. The sequence of Cha f 1 is shorter than the shrimp tropomyosin sequences, lacking the 20 C-terminal residues. Leung et al. (1998)  argue that this is a genuine difference. However, Swissprot has marked the sequence as partial. Over the 254 residues of the common sequence, Cha f 1 and Met e 1 have 91% sequence identity. Reese G, Tracey D, Daul CB, Lehrer SB. IgE and monoclonal antibody reactivities to the major shrimp allergen Pen a 1 (tropomyosin) and vertebrate tropomyosins. Ayuso R, Reese G, Leong-Kee S, Plante M, Lehrer SB. Molecular basis of arthropod cross-reactivity: IgE-binding cross-reactive epitopes of shrimp, house dust mite and cockroach tropomyosins.